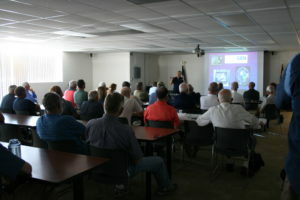 On July 1st I had the pleasure of speaking to the Colorado Pilot’s Association at Front Range Airport east of Denver. 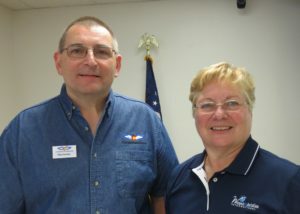 Michael Koscielniak, the Safety coordinator of the group arranged for me to give a FAAST Wings Credit Seminar. The topics were “Filing ICAO Flight Plans” and the “Future of Air Traffic Control”. Both very timely topics. In addition to CPA members, the local Civil Air Patrol was represented. Front Range Airport is beautifully set up for general aviation. The main terminal has a dynamite restaurant and there are several large meeting space available on the grounds. It is conveniently located close to Denver, but far enough away from the heavy traffic patterns of DEN and APA to make getting in and out easy for small aircraft. President, Gary Tobey, made me feel very welcome as did the whole group. About 40 members gave up flying on this gorgeous day to join us. They had really good, relevant questions – always a pleasure for a presenter! The occasion was also special to me personally for two reasons. A board member of Wings Over The Rockies Air and Space Museum attended the event and personally extended an invitation to speak at that venue in the future. Aviation history is one of my favorite fields of study. My presentation on the History of Air Traffic Control has been given to Embry Riddle University events and it is what I will be speaking on during Oshkosh AirVenture this year. I also enjoyed the support of my sisters, Bernadette and Donna who accompanied me to the event and helped at my book table. It’s not often your siblings – who work in very different fields – take the time to see big sister in action! CPA is a very active and diverse organization with comprehensive training and social events – any of you living in the great state of Colorado should check them out! ⟵Rose Takes to the Great Lakes States!